Thanks to Bargain Blessings for putting together a GREAT list of Memorial Day Deals and Specials! I’ve shared a few of my favorites below, but check out her site for a complete list! Save $2 off a Big Bagel Bundle (a dozen bagels and two tubs of cream cheese) with this Bruegger’s coupon through May 28th. 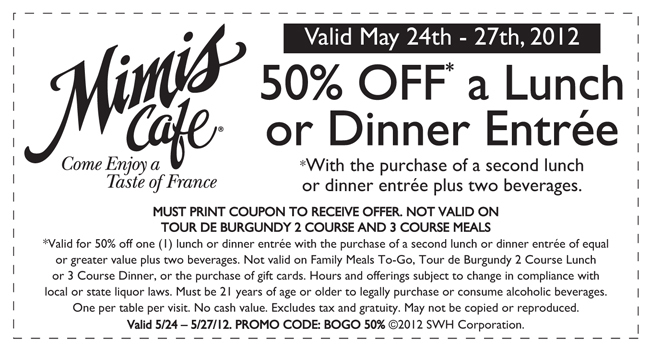 Use this Mimi’s Cafe coupon through May 27th to save 50% off a lunch or dinner entree when a second one is purchased. Get a small sub, chips and a drink for only $2.99 with this Quiznos coupon! Save 20% off everything on Advanced Auto Parts, plus spend $100 receive $50BB coupon for future $100+ order with code ME20. This promotion runs through May 28th. Shop through the Ebates Memorial Day promotion and get double cashback at stores like Lowes, Kohl’s, Sears, JCP, HP and more! Save 50% off clothing, shoes and accessories, plus you can apply the coupon code TENOFF to save an additional 10%! Shop through Ebates to get 3% cashback. Get $12 2012 Entertainment books plus free shipping! Save 20% off your purchase from Famous Footwear through May 28th by using the coupon code MEMORIAL12. Save an extra 20% your toal purchase on Kohl’s with the coupon code SUMMER20. Save 15% on an order placed through May 28th by using the coupon code SUMMER15. Shop through Ebates to get 3% cashback. Save 25% off sitewide on Maidenform. There is no coupon code required for this discount. Save 50% off of everything in their online store as part of their Memorial Day sale! There are items starting as low as just $4.95. There is no coupon code required for this one and shipping is a flat $6. Save 50% on hundreds of items from PetSmart May 25th through May 28th. Also, use the coupon code 12P5EM4 to get free shipping on a purchase of $100 or more. Shop through Ebates for 4% cashback! Sears is running a bunch of different Sears Memorial Day deals! You’ll find: 40% Off All Housewares, Up to 55% Off All Patio Furniture, 25% Off Eddie Bauer & Safety 1st Strollers, 15% Off Sandals for the Whole Family and Free Shipping on Many Items $25+! Shop the Veggie Tales store through Memorial Day and save 30% off Storewide, plus get DVDs for as low as $3.93 shipped! 6pm will have 25,000 items marked down to $25 or less, plus free shipping on all orders. The 6pm Memorial Day sale will start on May 25th at 6am PT. Save 20% on your purchase at Famous Footwear with this printable Memorial Day coupon. Save $10 for every $50 that you spend at Shoe Carnival through May 28th with this printable Memorial Day coupon. « Lots of BABY Product Coupons!